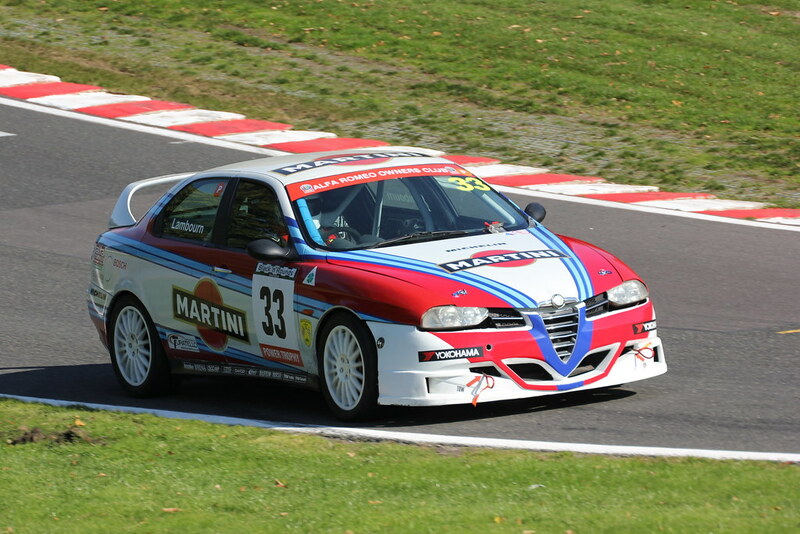 Oulton Park is a fabulous circuit that features hairpins, a chicane, sweeping downhill sections, short and long straights and challenging corners, any one of which can catch a driver out if concentration lapses. 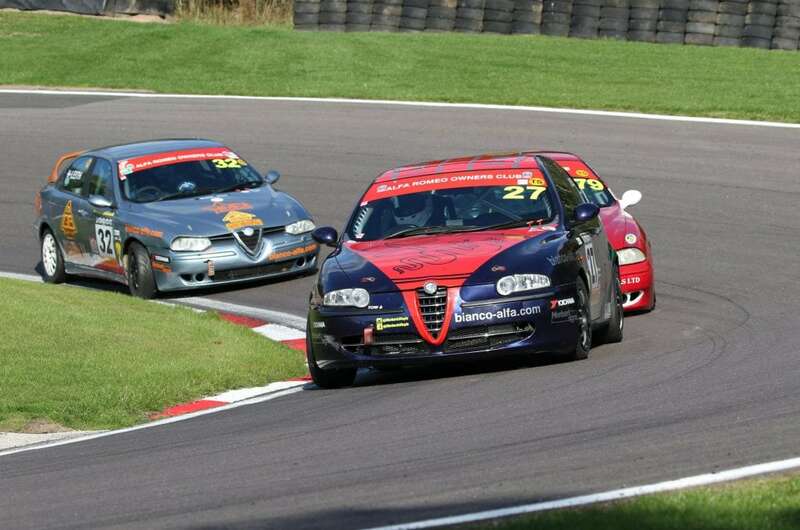 So it was entirely suitable as the location for an end-of- season decider for the BRSCC Alfa Romeo Championship. 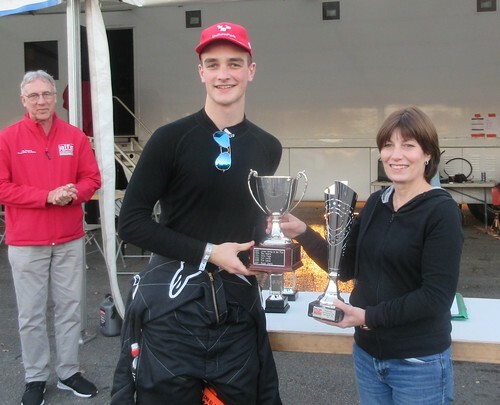 Twin Spark Cup and overall Championship leader Tom Hill needed only a smattering of points from the 2 races to be confirmed as Champion and he only needed those if Paul Webster was able to extract maximum points from a competitive Power Trophy field. 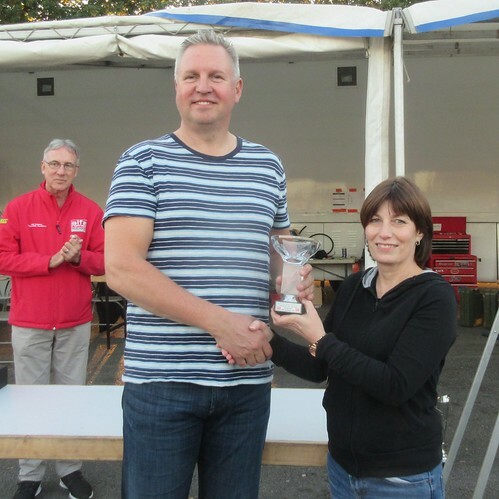 Other Championship places were also up for grabs, with Kristian Leith, Scott Austin and Dave Messenger all able to move into podium positions, while Richard Ford was only able to gaze wistfully from overseas and hope others messed up (safely of course). The Friday before race day had been a bright, sunny and, by afternoon, very warm. Saturday dawned much cooler but still with sunshine and clear skies – perfect racing conditions. 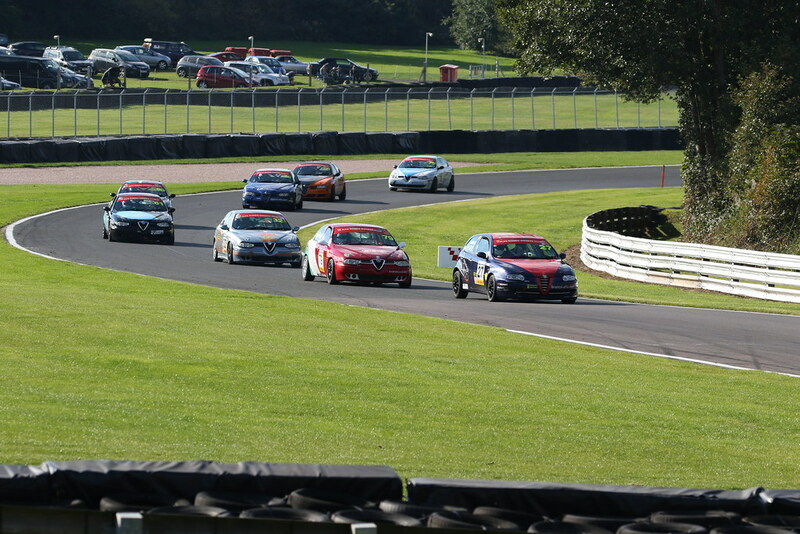 There was a 14-car grid; we would have hoped for more of course, but the quality of the field spoke for itself and some superb racing was in prospect. 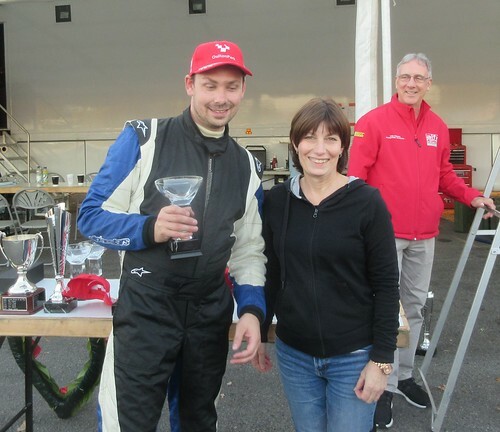 We had one debutant: Dave Lambourn arrived with his newly built 156 3.0 litre Power Trophy car, looking resplendent in its Martini livery. 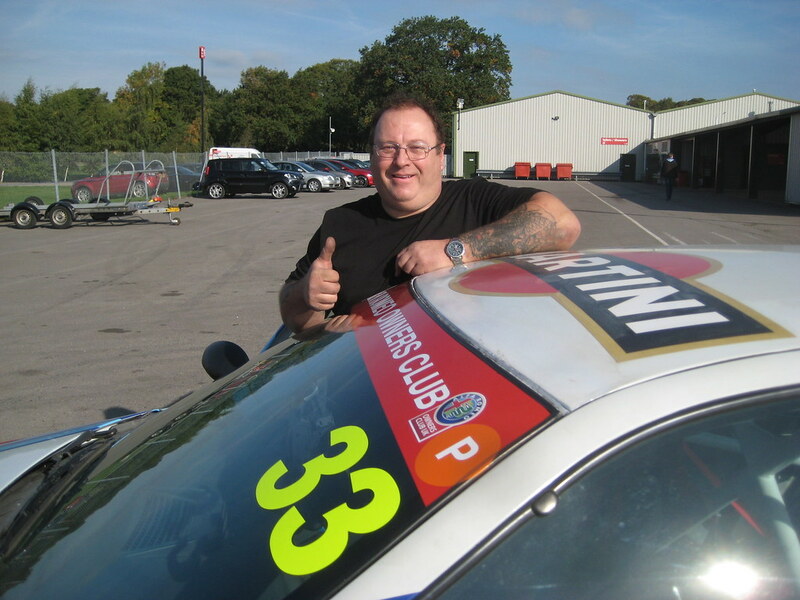 Dave was hoping to get through scrutineering safely and to complete the races as a starting point for himself and the car. 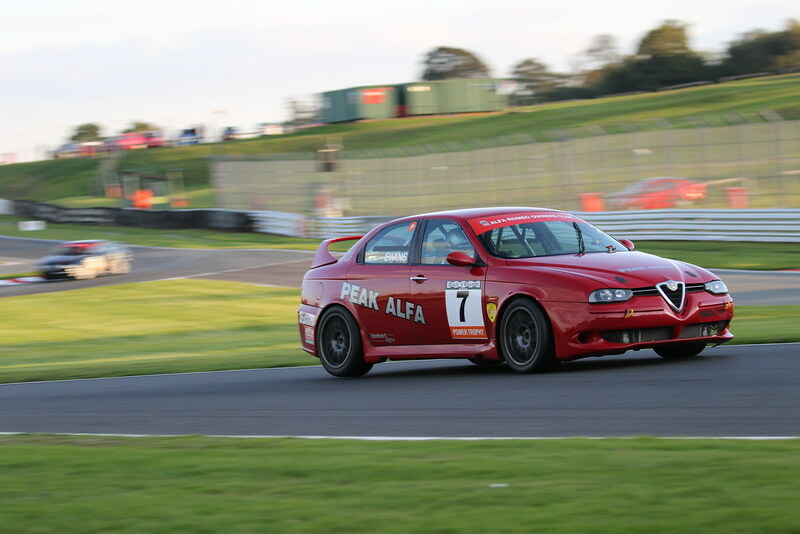 Also making a welcome return to Alfa racing was James Ford, driving his recently acquired full ownership of the 3.0 V6 156, the one that has proved very competitive in the Power Trophy in Paul Plant’s capable hands on occasions last season. 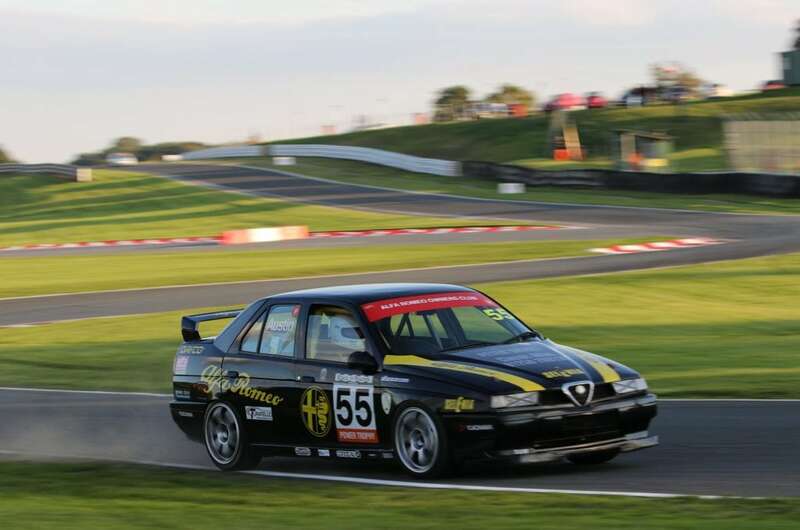 James acknowledged that the car needed more work than he had been able to give it in the fortnight or so he had since deciding to race it at Oulton, but was hoping to put in a decent showing. Another early casualty, sadly, was Dave Lambourn. On only his second flying lap an ominous knocking sound from the big end signalled a major engine problem and he returned to the paddock, unable to participate any further in the weekend’s events. He was soon on the phone to his engine supplier and we hope that the problem can be sorted out to enable him to compete next season. Meanwhile, Paul Webster was also clearly in difficulties, still circulating but well off the pace being set by those recording the quickest times. At the end of the session he and Tom Hill were 2 of the 3 slowest cars in qualifying – a strange place indeed for the 2 Championship contenders. So, I’ve started this report with those experiencing problems. What of the front runners? Roger Evans stamped his authority on qualifying from the outset. His first flying lap was the quickest of all at that stage – 2:03.184 – and he was never headed after that. 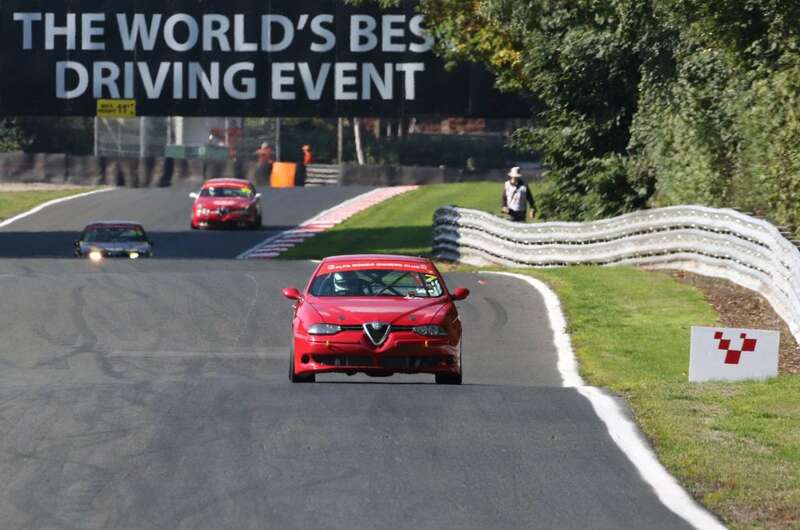 He was struggling a little with some gears – the car bearing some scars from recent outings in that respect – and was driving on unfamiliar tyres but was still 1.7 seconds clear of the rest. An uncooperative brake pedal saw him in the gravel on his 5th lap but he recovered quickly, a 2:01.662 on his 6th lap setting pole. 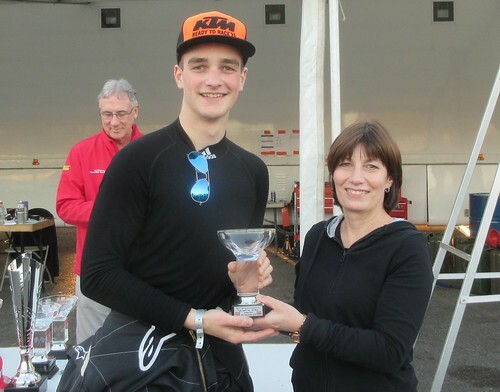 Second quickest was Scott Austin with a time of 2:03.378 on his penultimate lap. Scott has plans in hand to make the car quicker next season and was again frustrated at the fact that others were able to pull away from him on straights here, but the car had run reliably and he felt reasonably happy with his time. 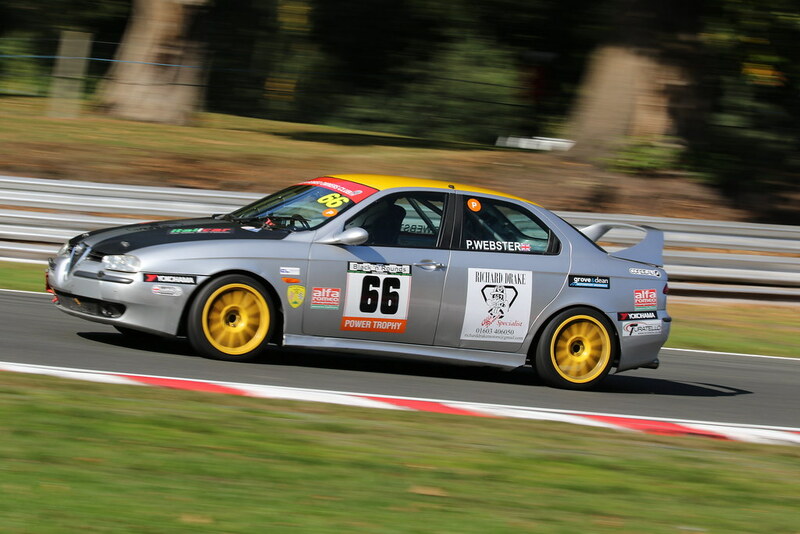 While Paul Webster was languishing down in the depths of the timesheets James Ford was getting progressively to grips with the Power Trophy 156. 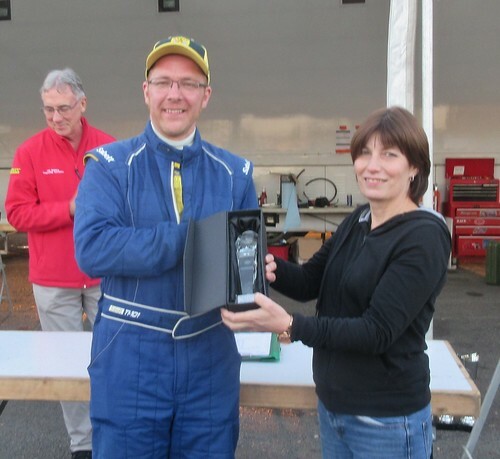 A former class winner in Twin Sparks, this was his first outing in a more powerful car and after a hiatus in racing to boot, but James is a very talented driver and each of his 8 laps was significantly quicker than the previous one, working down to 2:05.560 on his final lap to take 3rd spot on the grid. He was characteristically modest about his prospects in the race but nevertheless it was a performance full of promise despite the off-putting propensity of his engine to cut out at inconvenient moments. An air flow meter loaned from Dave Lambourn’s 156 appeared to resolve the problem. In the Twin Spark Cup, Kristian Leith demonstrated unequivocally the progress he has made this year. He pitted after a couple of laps to check things over but then rejoined and went quicker and quicker towards the end of the session culminating in a quickest time of 2:07.126 on his final lap to take pole, or what would have been pole were it not for a 2-place grid penalty from a misdemeanour at Rockingham 2 weeks previously. Nevertheless it was an impressive performance that boded well for his chances in the race. Second quickest with a superb qualifying effort was Ricky Losselli, another driver who has made excellent progress in his maiden season. 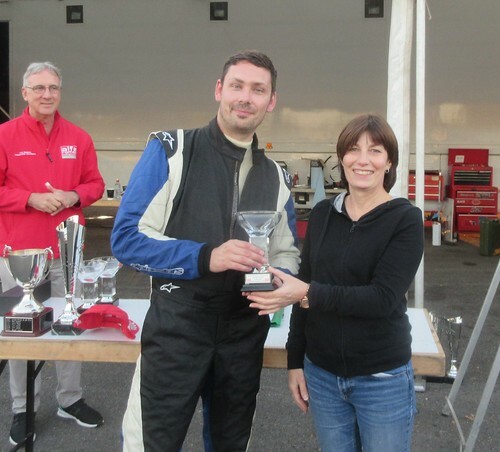 A lap of 2:07.433 would see him second quickest but elevated to pole – a well earned reward for a modest, knowledgeable and popular member of our racing community. 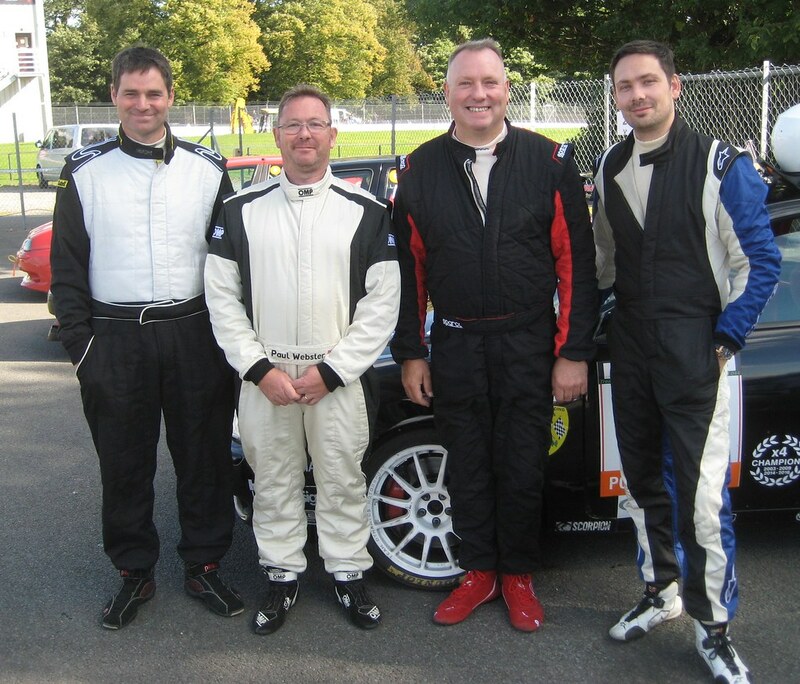 Ricky would be joined on the Twin Spark front row by the redoubtable and experienced Dave Messenger, 3/10ths adrift with a time of 2:07.719, but Dave is renowned for his fast starts, so the first lap promised to be an interesting challenge for Ricky. Next was Simon Cresswell. Earlier in the season Simon was further down the grid than we have become accustomed to seeing him, but he had been running into form recently and with a best lap of 2:07.875 a promising day’s racing lay ahead for him. 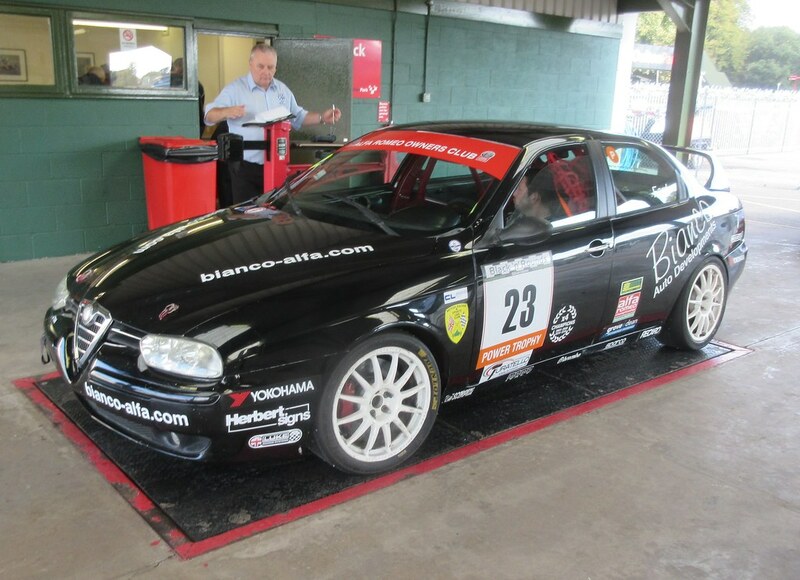 Cip Nistorica had missed the Rockingham weekend but, after testing the previous day in the 1m 10s, he was a happy with a 2-second improvement of 2:08.148 to take 5th spot on the Twin Spark grid. 6th quickest Twin Spark was Chris Healey. Chris has been sharing the car with Mel Freeman during the latter part of the season and had been near the tail of the field in his earlier outings, but the improvements in the car that benefitted Mel at Rockingham showed through here and we saw Chris nearer the front of the grid as we might anticipate from a driver of his capabilities and experience – he was right in the mix here with a best lap of 2:08.204. Mike Tydeman was 7th quickest Twin Spark. 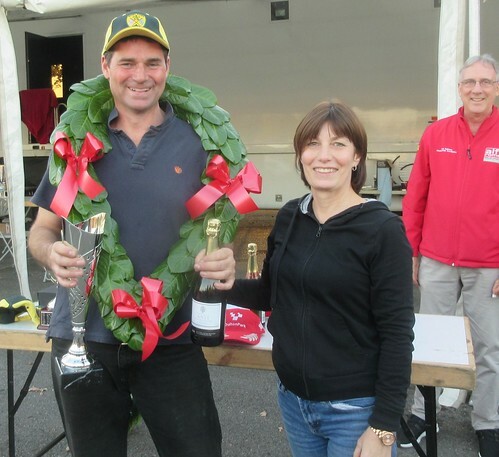 Mike has had an up-and-down season, starting off with some excellent finishes, but then a motorbike accident and a couple of missed events had seen him drop down the points table but 2:08.570 suggested he was capable of a good showing here. Finally, just ahead of the troubled Tom Hill was Andy Inman. After the electrical gremlins that put him out of contention at Rockingham, Andy was initially hopeful of a good showing here. He had a couple of laps disallowed for exceeding track limits which might have put him further up, but he would line up 8th between Mike Tydeman and Tom Hill. After the session Paul Webster reported that his engine ‘would not rev out’. With a rebuild needed, he felt the best he could do was to finish and claim enough points to secure the Power Trophy class win for the season. However, Tom Hill was also in a predicament: Harry and the team at Bianco were toiling over the car to try and cure a chronic misfire but, with Race 1 looming, a solution seemed as far away as ever. 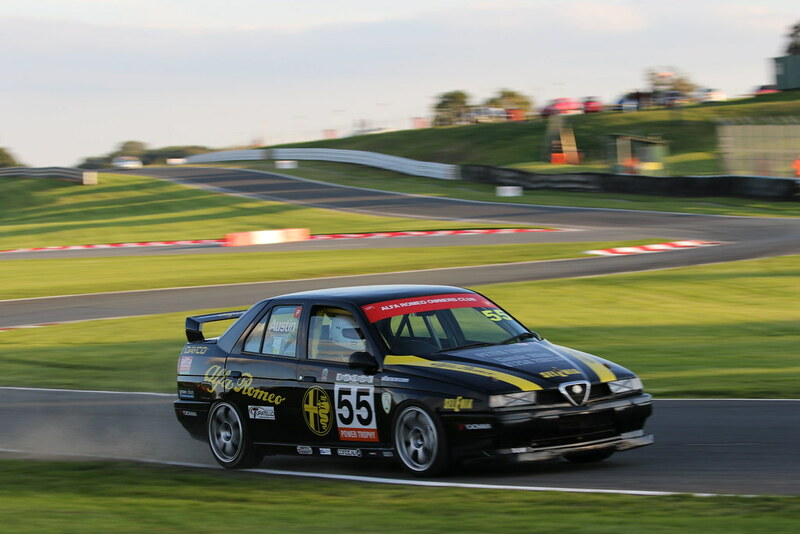 So Tom activated the necessary procedure to secure approval to use a different car – Andy Hancock’s 156 which had been loitering balefully on the Bianco transporter longing for an opportunity to show its mettle – for the races. As the lights went out Roger Evans was initially quickly away but then a recalcitrant 2nd gear dropped him to 4th briefly before entering Old Hall in 3rd place behind Scott Austin and Paul Webster, with James Ford 4th. However, Roger soon moved into second and reclaimed the lead by passing Paul along the Hill Top straight from Britten’s. 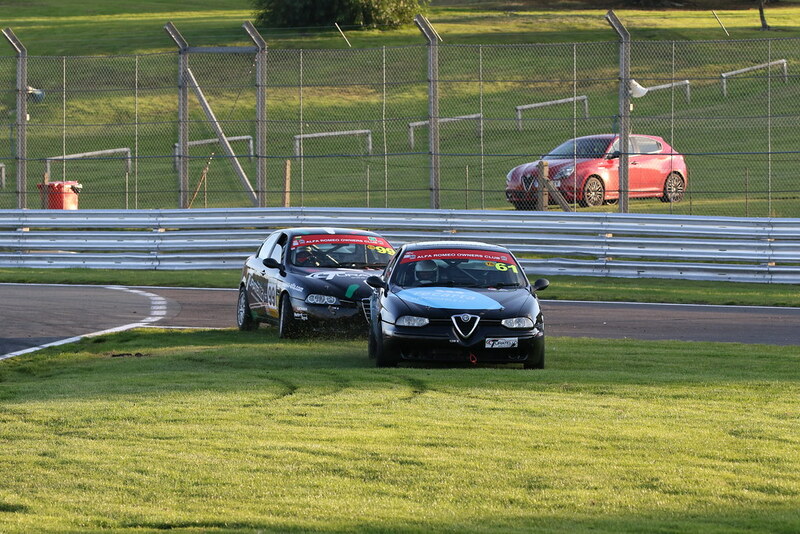 Behind him, James moved ahead of Scott under braking into the Hislops chicane and took 2nd from Paul at Lodge corner. As the cars passed through Deer Leap at the end of lap 1, Roger was 2.5 seconds clear of James; Paul was still ahead of Scott at that point but was passed by him on lap 2 and dropped further and further behind him over the next few laps, the gap being 7 seconds by the end of lap 5. Paul then clawed some time back and was only 3 seconds behind Scott at one point but then dropped back again to finish 18 seconds adrift at the flag. At the front Roger was pulling away from James at over a second a lap and completed a dominant win by some 16 seconds at the flag; however, James was showing definite signs of getting to grips with the car and early in the race particularly was some 3 seconds per lap quicker than he had been in qualifying, a very good performance despite continuing brake problems that resulted in the radiator being vibrated off its mountings and needing emergency repairs prior to race two. Before the flag dropped for the Twin Spark grid start Dave Messenger had begun creeping forward and beside him Ricky Losselli did the same, with one eye on the starter and the other on Dave. They both got away well with Ricky taking the lead, but alas too well – the chief start line marshal appeared in Race Control with a report of a clearly jumped start by both drivers and the Clerk of the Course imposed a 10-second penalty each, although of course neither driver was aware of this until after the end of the race. At the end of lap 1 Ricky was leading from Dave on the road, followed by Kristian Leith hot on Dave’s heels. 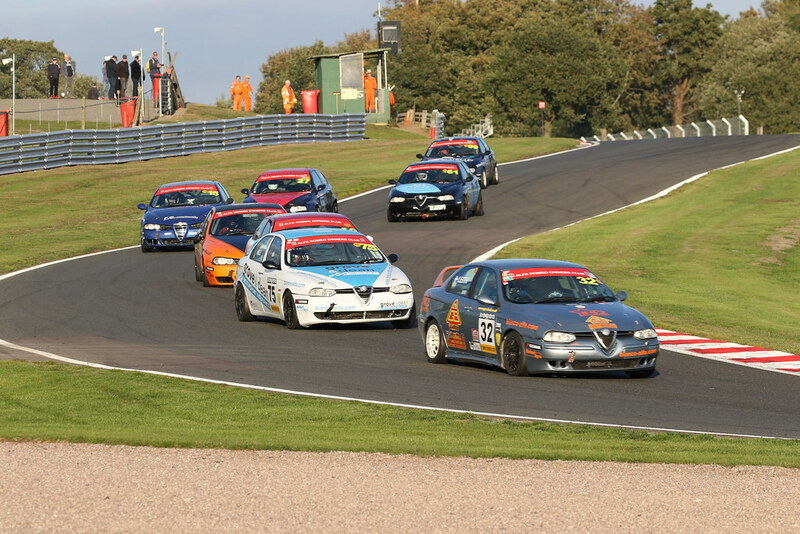 Chris Healey had made an excellent start and was 4th, followed by Cip Nistorica, Mike Tydeman, Simon Cresswell (not such a good start), Tom Hill and Andy Inman. Andy seemed to be already in trouble as he was several seconds behind the rest and he dropped further and further back before pitting and retiring at the end of lap 6 with a recurrence of the electrical problems that had sidelined him at Rockingham, the consensus of opinion being that a new – and simpler – wiring loom is what is needed. Hopefully we will see this popular driver running well again next season. At the front Ricky Losselli, Dave Messenger and Kristian Leith were running in very close formation and on lap 4 the order changed dramatically; Kristian got past both Dave and Ricky with a brave move around the outside at Old Hall to take the lead, then Dave moved alongside Ricky through Dentons and had reclaimed 2nd spot by the time they exited Cascades. Behind the front 3 the running order was also changing dramatically. 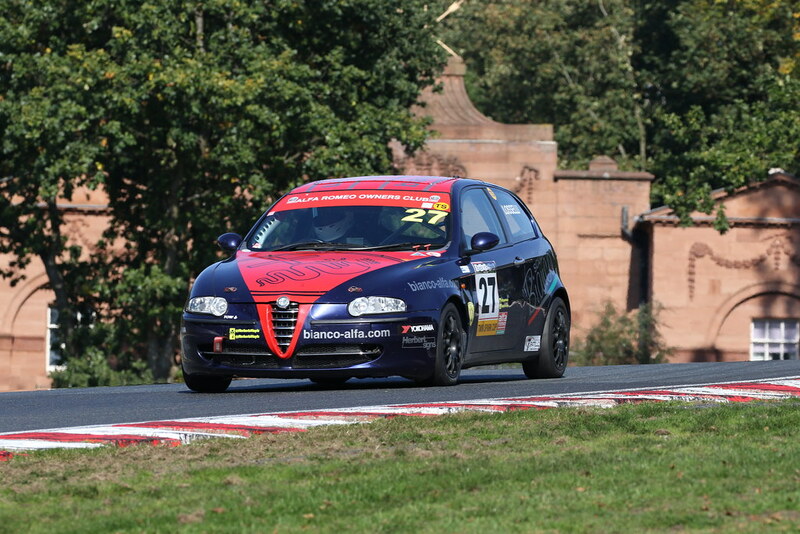 Tom Hill passed Cip Nistorica and Mike Tydeman on lap 3 and Simon Cresswell passed Chris Healey to go 4th in class. Tom also passed Chris on the next lap and the race then developed into 2 separate and very close battles: a five-way battle for the lead between Kristian, Dave, Ricky, Simon and Tom with only a 2-second gap between 1st and 5th places, and a few seconds back an equally close battle between Chris Healey, Mike Tydeman and Cip Nistorica running virtually nose to tail. 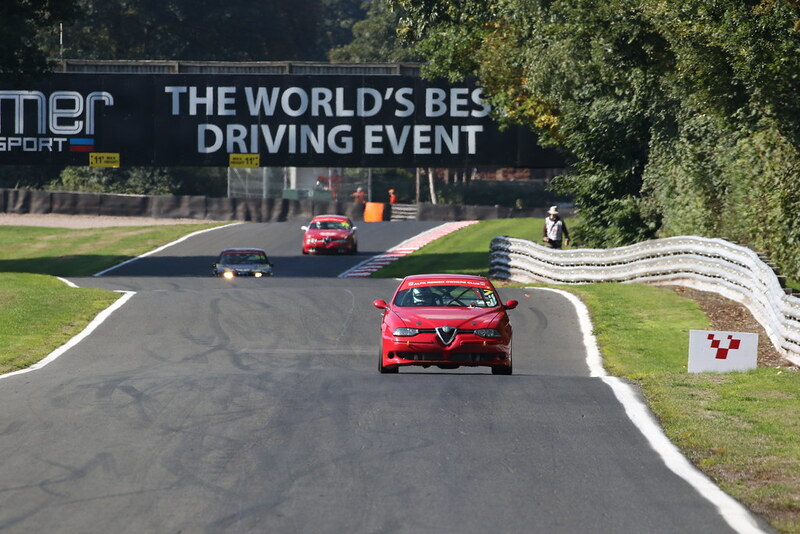 In the end both battles finished in the order above on the track but the quality of the racing was superb and the excitement of the spectacle was an absolute treat for the spectators. 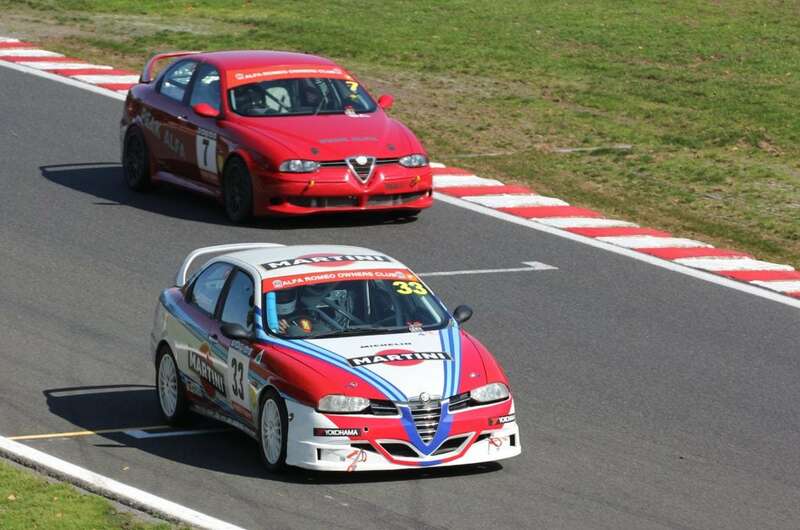 When the 10-second penalties were applied to Dave and Ricky they dropped to 4th and 5th place respectively, elevating Simon to 2nd and Tom to 3rd but the impressive Kristian Leith didn’t need the penalties – he finished first on the road anyway to take a popular, well deserved and well earned first Alfa Championship class win. For the first time this season our second race was the last of the day. The Twin Spark Cup winner would lift the Kevin Griffiths Trophy, which was being awarded for the 17th year in succession in memory of Kevin. Andy Inman’s engine problems made him a non-starter along with Dave Lambourn so 12 cars went to the grid. 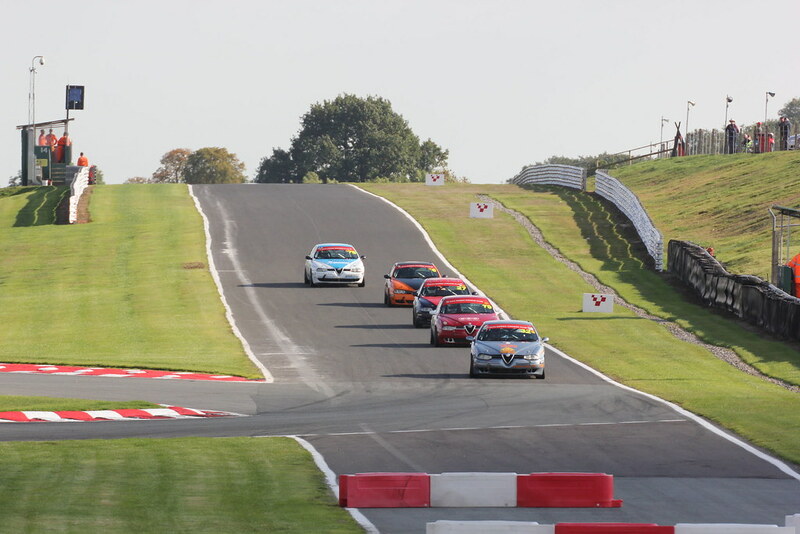 When the lights went out to start the Power Trophy cars Roger Evans made an excellent start this time to take the lead into Old Hall followed by James Ford, Scott Austin and a very slow-starting Paul Webster. 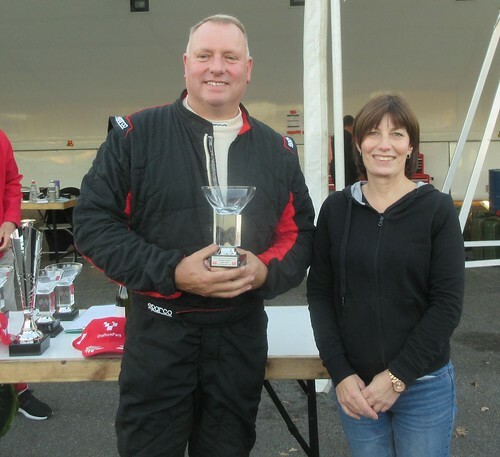 Paul’s engine problems had clearly worsened: he was circulating slowly and by lap 2 had been passed by the entire Twin Spark Cup field, and it was clear that he was just intent on finishing the race to preserve his Power Trophy class win for the season. When the Twin Sparks got away Kristian Leith made an excellent start to lead into Old Hall but hot on his heels was Tom Hill who had gone from 3rd to 2nd and was clearly in irrepressible form. 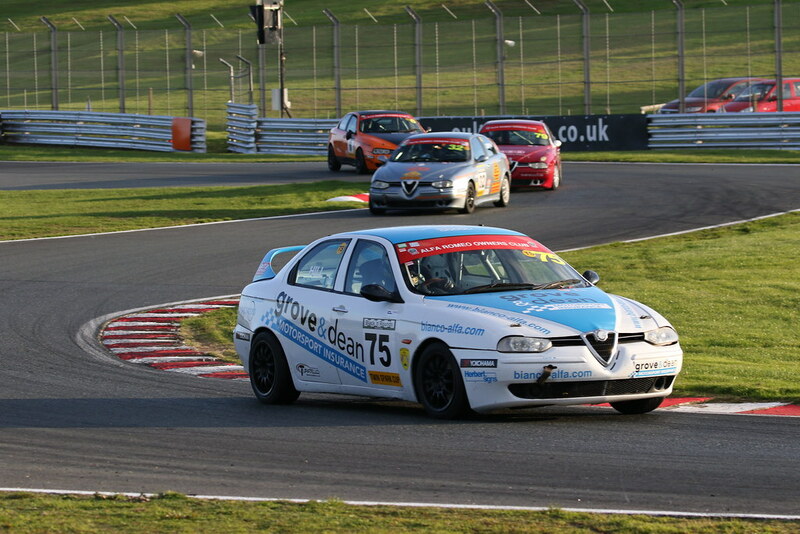 Kristian was unable to hold him off for long and Tom was through into the class lead by the end of lap 1. Thereafter, with Kristian having to work hard to defend his 2nd place, Tom pulled further and further away, not sitting on his lead at all, as his fastest 2 laps were the very last 2 of the race. 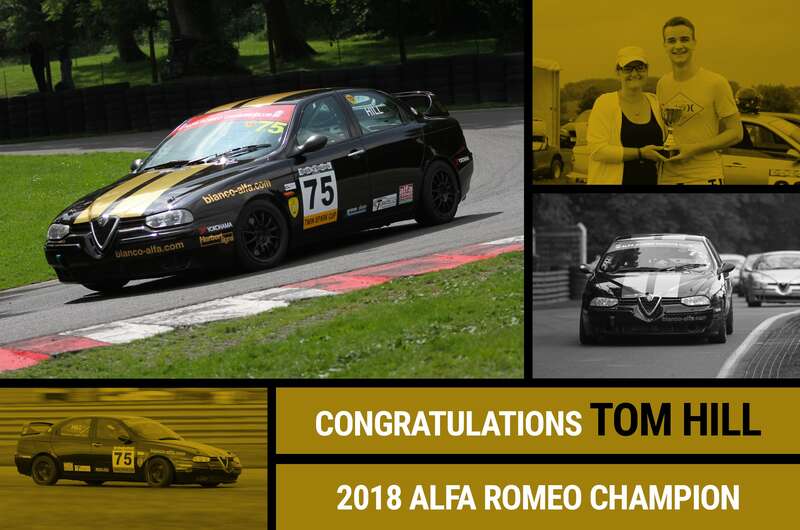 It is well known that the build on Tom’s race car was completed with a lot of attention to detail by Bianco, but here he was climbing into a different car and finishing some 11 seconds clear of 2nd place: a class act, a superb drive, a worthy race winner and a worthy 2018 Champion. Amen. Behind Tom, battle had been joined for 2nd place. Kristian Leith was having to work hard to defend his place from Dave Messenger who was very close behind him and looking for a way through until lap 4 when Dave’s engine suddenly lapsed onto 2 cylinders and he came slowly round to the pits and into retirement. There was no rest for Kristian though; Dave’s place was simply taken by Simon Cresswell and the need to defend continued unabated. For lap after lap they circulated a 10th of a second or two apart. At one point Simon nearly got past under braking for Old Hall but wisely backed off to avoid a possible incident and at the flag Kristian finished 2nd by half a second from Simon in 3rd. The race order for the final 4 cars was established on lap 1 and did not change thereafter but the racing was very close and a single mistake by any of the drivers would have proved costly. Mike Tydeman won the battle for 4th from Ricky Losselli, Chris Healey and Cip Nistorica with only 4 seconds between them at the flag. 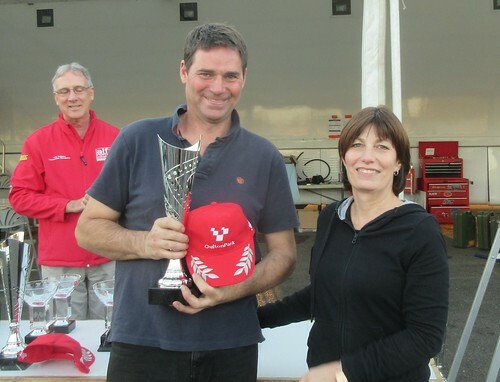 In the Power Trophy, Roger Evans steadily increased his lead over James Ford but not as dramatically as in Race 1. By mid-distance James was certainly keeping Roger honest, always in sight in his mirrors and on laps 7 and 8 was actually quicker than Roger before dropping away a little at the end to finish 6 seconds adrift. Scott Austin was a lonely 3rd, lonely that is until he backed off towards the end and only beat the rapidly closing Tom Hill to the line by 0.039 seconds! 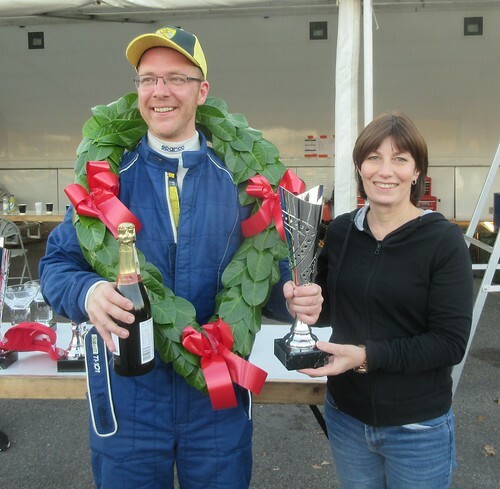 Paul Webster made it to the finish to claim 4th place in class a lap down and won his class for the season and finished second overall to Tom in the Championship. 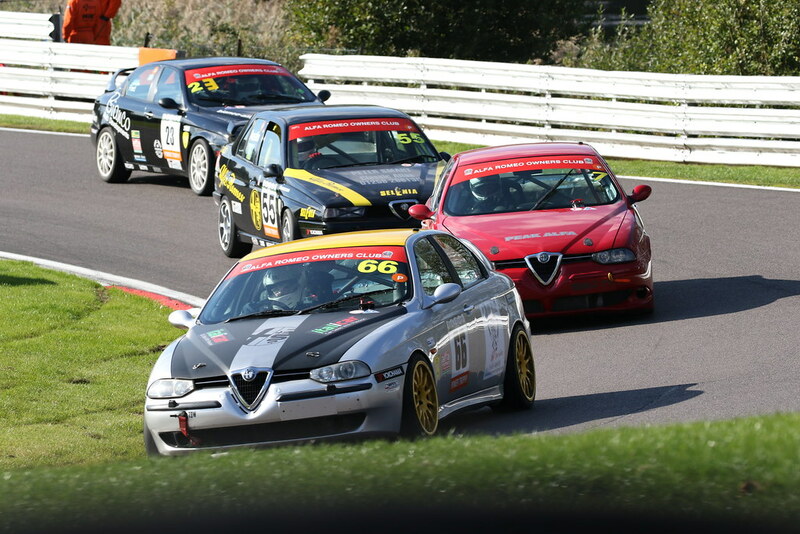 So ended the day and so ended another exciting season for the BRSCC Alfa Romeo Championship. Our one big goal for next year of course is to attract bigger grids, but the quality of the racing – over the last few meetings in particular – has been superb and a credit to all our competing drivers. We are now looking forward to our Awards evening on 10th November and to a successful 2019!